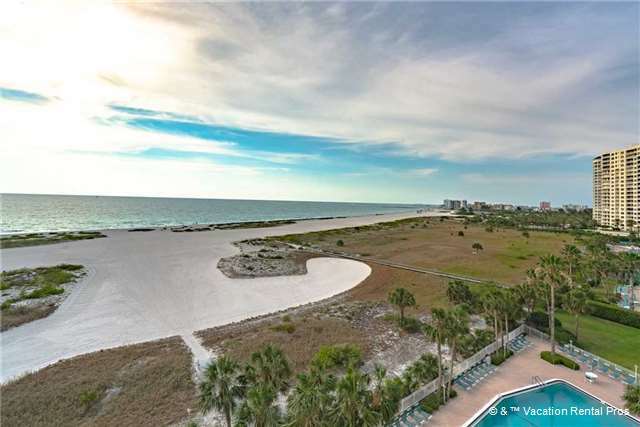 As you gaze out the window of Harbor Light Towers 803, all you’ll see is sand, surf, and sky—and perhaps a few dolphins playing in the waves. 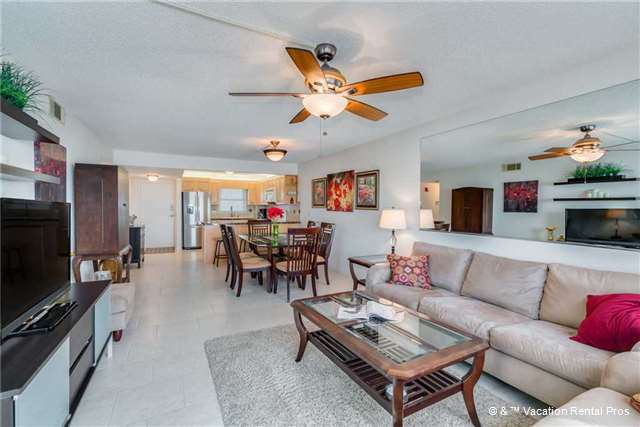 The 2-bedroom, 2-bedroom condo overlooks the beach and the Gulf of Mexico. Vacation getaways don’t get much closer to the water than this! 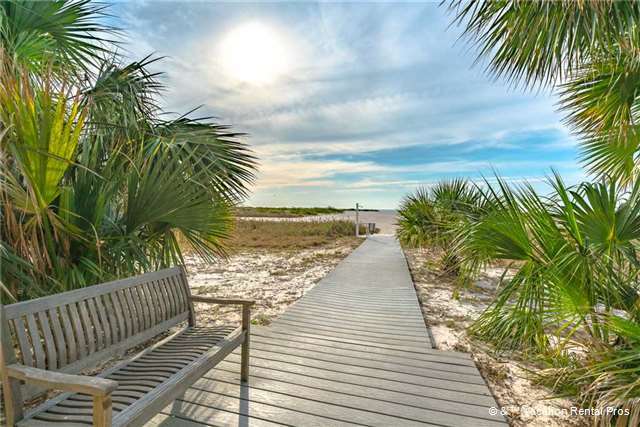 The condo’s spectacular location means you can walk to and from the beach throughout the day, via a private boardwalk over the dunes, as often as you like. 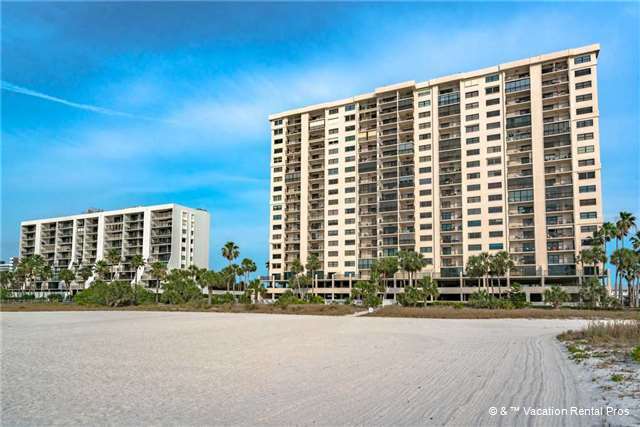 Given that Harbor Light Towers 803 has a 1-month minimum stay, you’ll be able to make the most of the beach proximity. 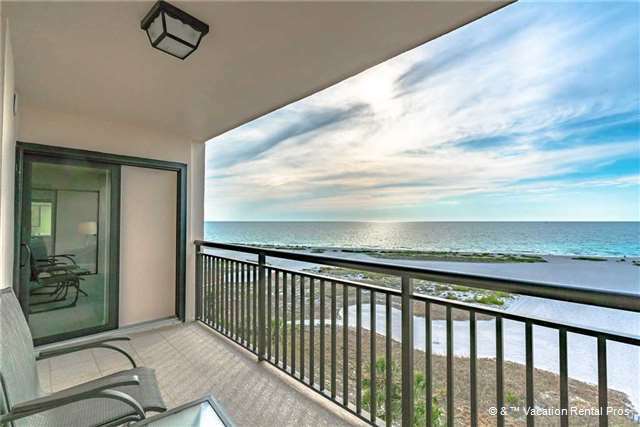 The location also means that from your balcony you’ll have a front-row view of the sunsets over the gulf. Bring a frosty drink, settle back in one of the balcony chairs, and revel in the brilliant colors, the salt-kissed breeze, and the seabirds swooping and sailing across the sky. 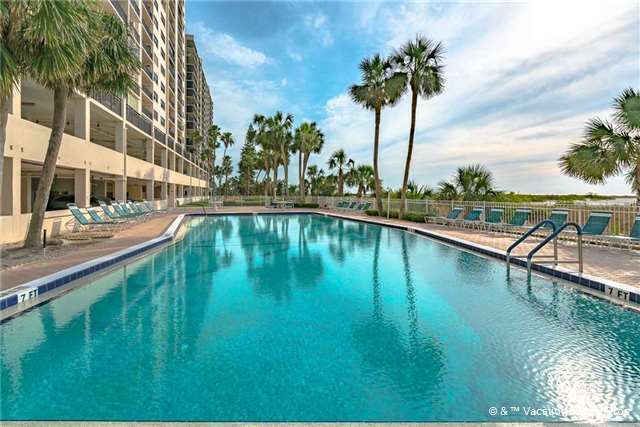 The condo complex has a heated beachfront pool as well, in case the gulf is a bit too cool for your liking. 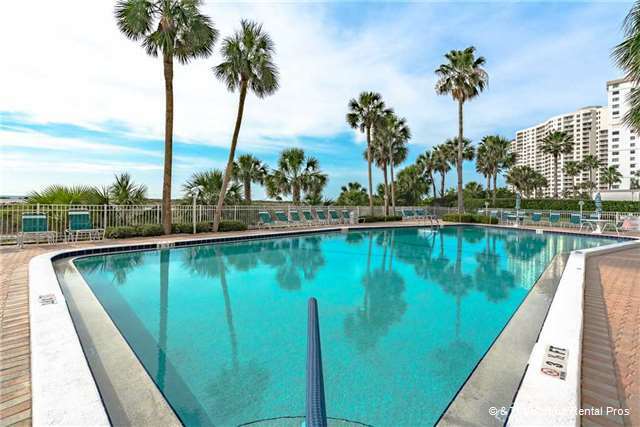 Surrounded by palm trees and furnished with chaises, the poolside patio is an inviting spot for lazing between dips in the pool, walks along the sand, or games of shuffleboard at the complex’s court. 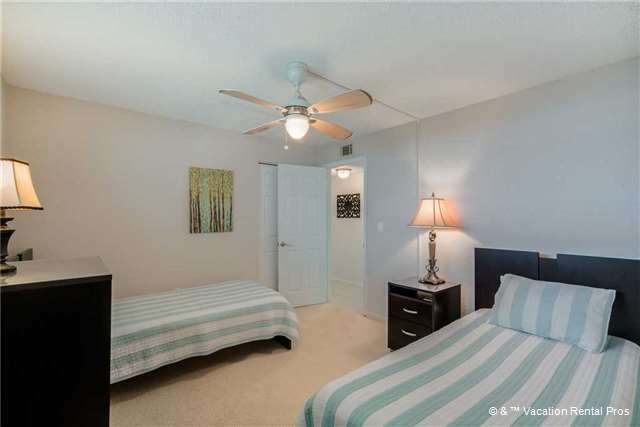 Of course, unit 803 is pretty inviting in and of itself. The living/dining area is decorated in soothing creams, just the sort of palette you want to surround yourself with after a day on the go. Sink into the sofa and watch TV, stretch out on the settee and take advantage of the free WiFi, gather around the table for a game of Uno with the kids—in other words, relax, recharge your batteries, and relish time spent with loved ones. The dining table seats 6, in well-cushioned chairs made for lingering in. Bring your favorite board games, and let family dinner segue into family game night. Three more people can perch at the adjacent breakfast bar. The kids can sit there and snack while you cook… or you can sit there and snack while someone else cooks! 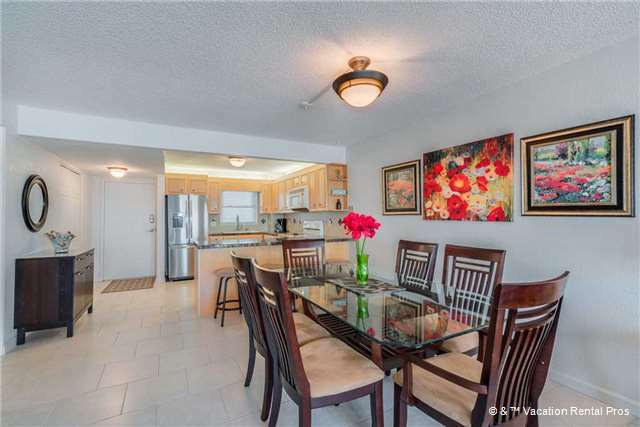 The kitchen is equipped with all the appliances, cookware, and tableware you could possibly need, whether you’re preparing a holiday feast or simply mixing mimosas to sip on the balcony. You can access the balcony from both the living area and the master suite. The master bedroom includes a flat-screen TV, a desk for catching up on work and emails, ample storage, and a queen-size bed. Before turning in for the night, step out onto the balcony to stargaze (so romantic! ), then let the sound of the surf lull you to sleep. 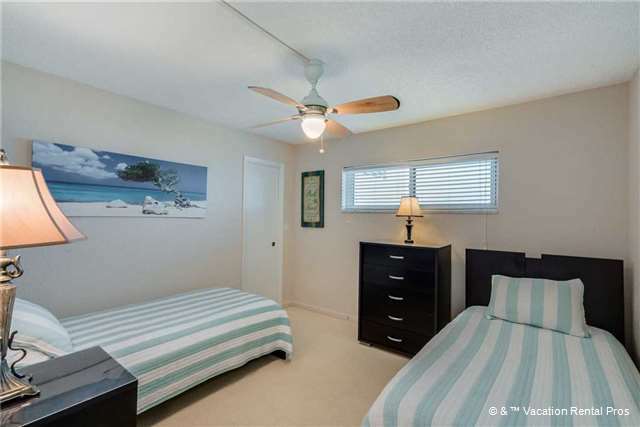 With 2 twin beds, the 2nd bedroom is perfect for the kids. 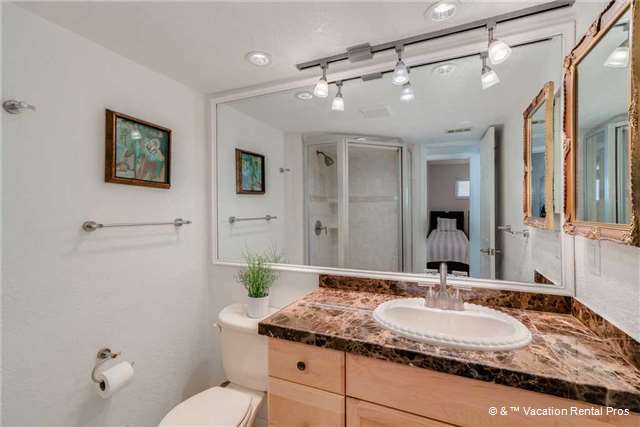 There’s plenty of space for them to spread out with their toys and games. And should you have additional overnight guests, the living area’s sofa opens into another queen-size bed, enabling Harbor Light Towers 803 to sleep 6 people in all. 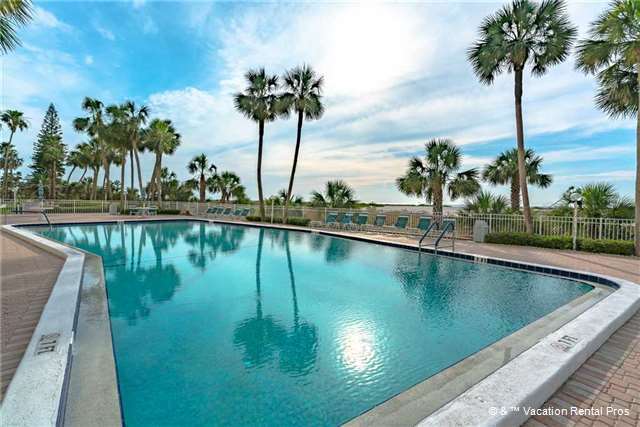 No doubt you’ll be spending much of your stay basking by the pool or canoeing, kayaking, paddleboarding, swimming, fishing, and bodysurfing in the gulf. But there’s even more to see and do nearby. 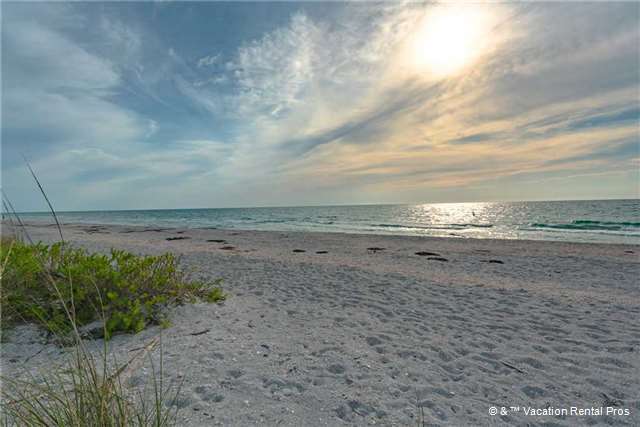 You can walk to Sand Key Park in less than 15 minutes; once there you can stroll the boardwalk, watch herons and other birds in the salt marsh, let the kids run around the playground, and get cooking on the grills. Numerous restaurants are within walking distance as well. 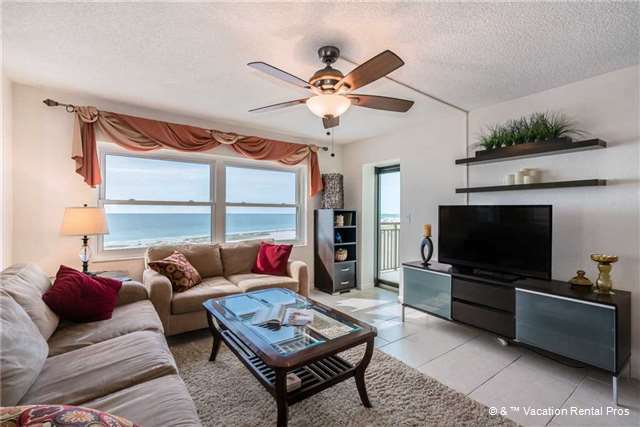 And you can drive to Pier 60, home of a nightly festival with artisans and live entertaining, and the Clearwater Aquarium in less than 15 minutes. 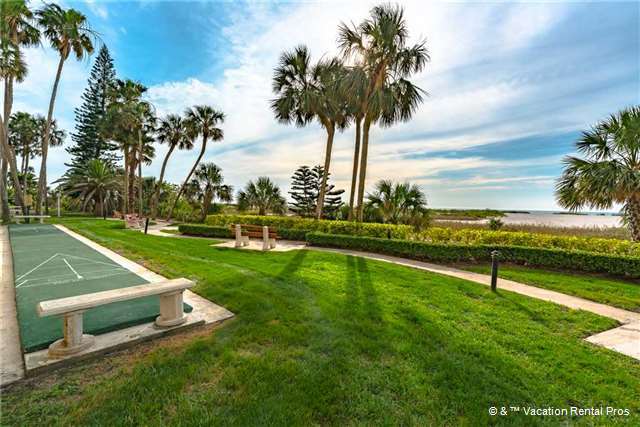 Here’s your chance to experience the delights of beachfront living and the laid-back Florida lifestyle. Don’t miss out: Book your stay at Harbor Light Towers 803 today.